This week's color challenge was an interesting one: YoYo Yellow, Going Gray and Basic Gray. I like yellow but this was definitely out of the norm so I wanted to play along. Even tho Stampin' Up! 's Hip Hip Hooray set is retired I still LOVE this set - I just think it is so cute! The balloons were stamped onto a scrap of card stock and cut out and adhered. The ribbon is May Arts - I got the idea to add the button with the little ribbon flag from this post Anna did the other day. The sentiment was stamped with yellow chalk ink and is kind of hard to see in the picture (you can click on it to get a pop-up window with a bigger image) - it says "birthday blowout" (the sentiment is from A Muse - I'm not sure if it's retired or not...). I actually really like this color combo! I think adding a teeny bit of an accent color (I was originally going to do blue but since I already had the pink out I went with that) just makes it POP all the more! STAMPS: Hip Hip Hooray set by SU!, sentiment by A Muse. CS: Papertrey White, Whisper White, YoYo Yellow, Going Gray and Basic Gray (all SU!). INK: YoYo Yellow, Going Gray and Basic Gray, Pretty In Pink. ACCESSORIES: Blender Pens, Ribbon, Button, String. I just made this card the other day and as I was browsing through SCS I saw this week's Sketch Challenge which was to make a tent topper card so this was perfect! I used GinaK's Sandcastle stamp - colored it in with Copic markers and cut it out. I adhered it to the Bashful Blue circle with dimensionals (I used my Marvy Super Jumbo (blue) circle punch) for the circle), then used a mega scalloped circle (pierced and outlined with a white gel pen) and giga scalloped circle to frame it. The "pattern" on the Creamy Caramel CS was made using the stitched mega circle stamp from Gina's Scalloped Frames & Doodles Large Circles Set, and I added the sentiment and a bit of the new Bashful Blue taffeta ribbon (LOVE it!!) from the SU catty. I used the new SU corner rounder punch (love that too) as well as did some faux stitching and that was it! 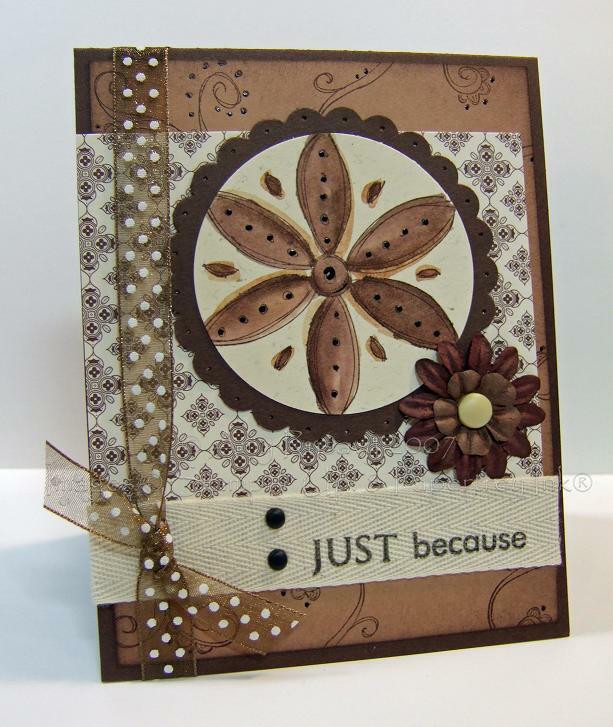 STAMPS: Sandcastle, sentiment and stitched circle all by GinaK Designs. CS: Papertrey White, Bashful Blue, Creamy Caramel, Real Red (all SU!). INK: Palette Hybrid Noir, Creamy Caramel. ACCESSORIES: Marvy Super Jumbo Circle, Mega and Giga Scalloped Circle Punches, Paper Piercer, White Gel Pen, Bashful Blue Taffeta Ribbon, 3/16" Corner Rounder Punch. I finally got a chance to do some stamping last night (we're all sick with head colds here and we're leaving for my brother-in-laws wedding tomorrow!! ACK!). On Monday the technique challenge that was posted on SCS was to do 3x3 "warm up" cards. I thought that would be a great way for me to get back into the swing of things and make a variety of cards. I ended up making about half a dozen little cards - here are the first 2 (I'll upload the rest after lunch!). I used my new Paper Salon Girly Girl set (I got it from eP some time ago) - having 2 girls of my own made this set a must have! 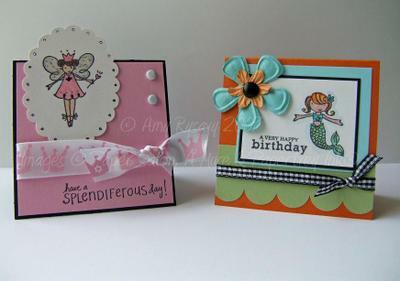 The sentiment on the mermaid card is from Papertrey's Faux Ribbon set, and the sentiment on the Fairy card is from A Muse. The blue Prima is from this Sprite package, the black gingham is Stampin' Up!, the crown ribbon (isn't it cute??) I got at Michales in the $1 bin, and the white brads are from Bazzil. I used Stampin' Up! markers to color in the images, and used my Sakura Stardust pen on the wings and crown of the fairy. Yup I had a lot of fun with this sheet of Chatterbox paper!! Last week's Limited Supply Challenge over at Splitcoast was to make birthday cards with "critter" or bug stamps - the challenge being that you had to create the card in under 45 minutes. Needless to say I was able to do all of them in that time frame (as in each card took me less than 45 minutes - I didn't do all 3 IN 45 minutes - I wish!! lol) - it's amazing how quickly cards can come together when the colors and papers and whatnot are already sitting out LOL!! 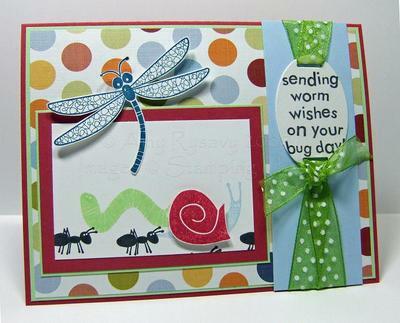 For this one I used the Bugs & Kisses set from Stampin' Up! - the dragon fly was stamped separate and cut out - it's adhered with bits of dimensionals under the body. The snail's shell is also cut out and on a dimensional. The sentiment *just* fit on that CuttleBug Slider die - and I attached it to the strip of Bashful Blue CS with my last piece of that fabulous May Arts ribbon!! ACK! I need to order more!!!! STAMPS: Bugs & Kisses. 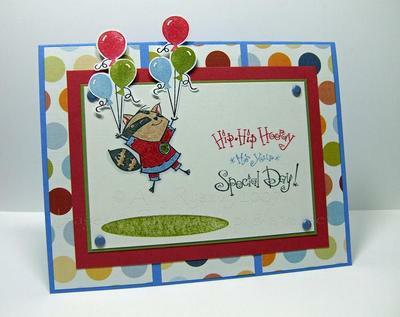 CS: Whisper White, Ruby Red, Gable Green, Bashful Blue, Patterned Paper by Chatterbox. INK: Ruby Red, Gable Green, Bashful Blue, Not Quite Navy, Palette Hybrid Noir. ACCESSORIES: CuttleBug Sliders Die, May Arts Ribbon, Dimensionals. I used SU! 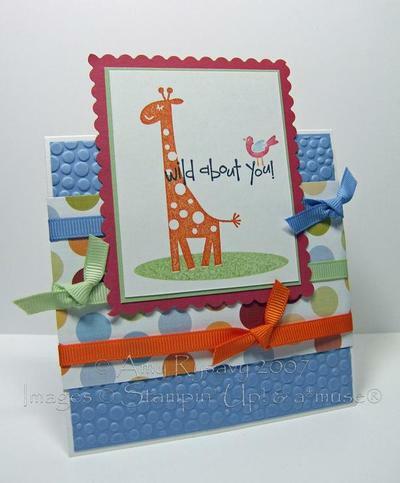 's Wild About You set (this has got to be one of my favorite animal sets - I just love the style of it! ), and my A Muse small oval as well of course! The scalloped mat was made with my Fiskars Scalloped Scissors, and I finished off the card with the grosgrain ribbon. STAMPS: Wild About You, Small oval by A Muse. CS: Whisper White, Certainly Celery, Ruby Red, Brocade Blue, Patterned Paper by Chatterbox. INK: Pumpkin Pie, Certainly Celery, Ruby Red, Brocade Blue, Basic Black. ACCESSORIES: Fiskars Scalloped Scissors, Various SU! Grosgrain Ribbons, CuttleBug Tiny Bubbles A2 Embossing Folder. *giggle* this card just makes me grin every time I look at it! I am SO pleased with how it turned out!!! I wasn't planning on it ending up this way - my original idea was to have the little guy standing *on* the "grass" holding the balloons - but as I was cutting the balloon images out it occurred to me to make him floating away - so I did!!! I still stamped the oval "grass" to emphasize him leaving the ground - LOVE it!!!! 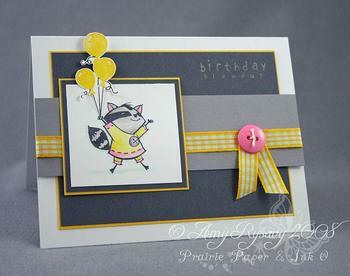 I used markers to get the different colors on the sentiment - as well as to color in the raccoon. The balloons are glued to his hands and the tops are attached with dimensionals so they're popped up (and no this card won't fit in a standard envelope as it's still 4.25x5.5 - but the balloons stick up too far and I wouldn't want to fold them. But I made this for my little brother who's 3rd birthday is next month - so I can just give it to him as is!). The layout is from last week's Sketch Challenge on Splitcoast - I LOVE that sketch - it's an awesome one for using up scraps of patterned paper! STAMPS: Hip Hip Hooray, small oval by A Muse. CS: Bristol White, Old Olive, Ruby Red, Ballet Blue, Patterned Paper by Chatterbox. INK: Palette Hybrid Noir, Old Olive, Ruby Red, Ballet Blue, Creamy Caramel, ACCESSORIES: Dimensionals, Brads. OK here is the birthday card I made to send to Shane (if you don't know who I'm talking about check out this post). I had a serious mental block making this - and only just got it done a couple of hours ago after staring at all my supplies for the past couple of nights!! I AM pretty pleased with how it turned out - I just hope he likes it!! 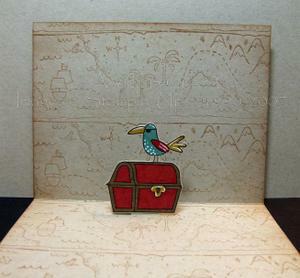 I used the Ahoy, Matey Stampin' Up! set (I know it's been forever since I've used any of my SU! sets!! Poor things are prolly feeling pretty neglected....) on Kraft CS and colored the images in with Prismacolor markers. This week's Sketch Challenge on SCS was a good jumping off point for me altho I altered the sketch a bit to suit how I wanted this card to look. I also decorated the envelope the back of which resembles the inside of the card where I just rolled the same jumbo wheel using Creamy Caramel Classic ink and then sponged the edges with the same color. I had SO much fun making this card for Shane - I can't wait to get it in the mail to him!! 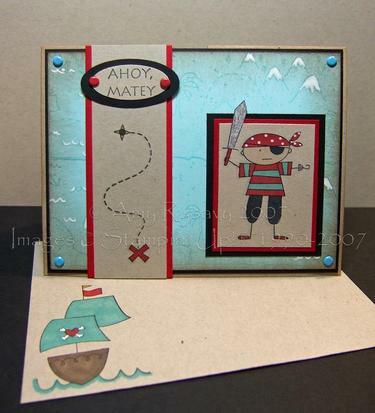 STAMPS: Ahoy, Matey, and Matey's Map Jumbo Wheel (both Stampin' Up!). CS: Kraft, Real, Red, Cool Caribbean, Basic Black. INK: StazOn, Creamy Caramel, Cool Caribbean, Real Red, Prismacolor Markers. ACCESSORIES: Brads, Small and Large Oval Punches, Sponges, White Gel Pen. Oh and I should mention that I really liked using the Prismacolor markers on the Kraft card stock AND I used StazOn to stamp those images and it didn't smear one bit! So I'm thinking that for those of you who are having trouble with StazOn smearing when you use these markers - it's the **CS** not the StazOn. I've been wanting to get back into doing the challenges on Splitcoast - they are SO fun and a lot of the time are great for stretching one's creativity. I know that for ME I really improved my stamping by participating in the challenges!! Check out the SCS challenge forums here - don't be afraid to dive right in!! On Monday the Technique Lover's Challenge was to use any shade of brown and any off-white color for your card but to NOT make it into a chocolate or coffee-themed card!! So I made a Just Because card *grin*. The new Doodle This stamp set arrived yesterday - I earned it for free based on my SAB sales (gotta love FREE lol!!) and I HAD to ink it up ASAP! The flower was stamped w/ Timber Brown StazOn onto Confetti Cream CS, watercolored w/ re-inkers, then I punched it out w/ my Marvy Mega Circle Punch and added dots of black w /my Sakura Black Glaze pen. I stamped the smaller flourish stamp onto the Creamy Caramel CS and added more dots w/ the Black Glaze Pen. The sentiment was made w/ my Paper Tray set (Black Craft Ink on SU! Twill Tape) and then the twill was adhered w/ double-sided tape. The cream-colored jumbo brad I got in a pack from the Dollarama, the polka-dot ribbon is May Arts, and the patterned paper is form the Au Chocolat DS pack in the Spring Mini. 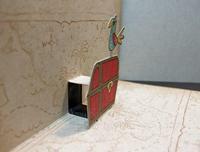 STAMPS: Doodle This, Paper Tray (by Papertrey Ink). CS: Confetti Cream, Chocolate Chip, Creamy Caramel, Au Chocolat DS Paper. INK: Timber Brown StazOn, Chocolate Chip, Creamy Caramel and Chocolate Chip re-inkers, Black Craft Ink. ACCESSORIES: Marvy Mega Circle and Giga Scalloped Circle Punches, Sakura Black Glaze Pen, Jumbo Brad, Primas, Twill Tape, Black Brads, May Arts Ribbon, AquaPainter, Paper Piercer. I *heart* the Bunny Hugs stamp set in the Spring Mini! (and Lauren I still blame you for making me get it but I don't regret it anymore LOL!!). I glued a small pom-pom (you can get those here) onto his tail too - I actually bought the pom-poms for exactly this type of thing LOL! The patterned paper is again Au Chocolat, and more May Arts ribbon, as well as grosgrain I got from Jody, and I tied on a bit of the ruffled ribbon that came in the Winter Mini. I made the scalloped borders using the SU slit punch, and the BG was stamped in Vanilla Craft Ink. 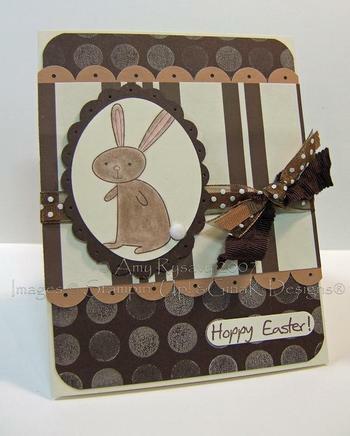 STAMPS: Bunny Hugs, Dotted BG, Hoppy Easter by GinaK Designs. CS: Very Vanilla, Creamy Caramel, Chocolate Chip, Au Chocolat DS Paper. INK: Chocolate Chip, Very Vanilla Craft Ink. ACCESSORIES: Stampin' Pastels, Pebbles Shimmer Chalks, Pom Poms, Marvy Mega Oval and Giga Scalloped Oval Punch, Paper Piercer, Ribbon, SU! Slit, Word Window, Small Corner Rounder and 1/16" Circle Punches. STAMPS: Watercolor Garden II (retired), Butterfly of Happiness, Happy Everything, Weave BG (Cornish Heritage Farms). CS: Whisper White, Certainly Celery, Basic Black, Lavender Lace. INK: Cranberry Crisp, Pumpkin Pie, Regal Rose, So Saffron, Bashful blue, Certainly Celery, Old Olive, Vintage Violet, Lavender Lace Classic and Craft. ACCESSORIES: Cloud Template (retired), Cutter Kit, Sponge Daubers, Black Brads, Paper Piercer and Piercing Template. I used the retired (and much loved) Watercolor Garden II stamp set for the flowers, and inked up the tips of the stems and leaves to make the grass. The BG was done using the (also retired - tho you can make your own from scrap paper or transparencies) SU! Cloud Template and stamping sponges. 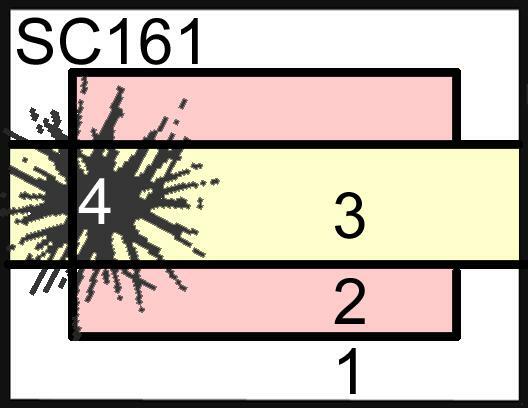 The 'happy' was stamped in craft ink so as to stand out more (since craft ink sits on top of the CS, whereas classic ink absorbs into the CS). I then stamped the small butterfly from the Butterfly of Happiness set (in the Winter Mini) to finish it off. The card base was stamped using the Weave BG (by Cornish Heritage Farms - I got it from stampingfreak.com) using Lavender Lace then I sponged Vintage Violet ink on the edges. 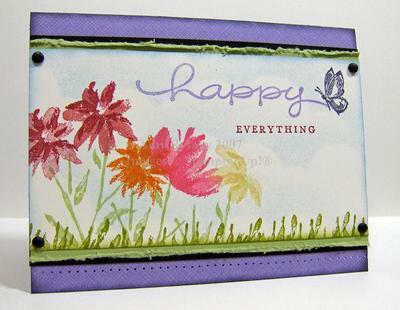 STAMPS: Shopabellas by Stamping Bella, Lrg skinny Oval by a*muse, Happy Everything (Stampin' Up!). CS: Whisper White, Regal Rose, Pretty in Pink, Certainly Celery, Chocolate Chip, Old Olive. INK: Regal Rose, Pretty in Pink, Certainly Celery, Chocolate Chip, Old Olive, Blush Blossom, Close to Cocoa, Creamy Caramel. ACCESSORIES: Prima Flowers, Bazzil Brads, Word Window Punch, Paper Piercer, Sponge Dauber. I stamped the shopabellas stamp (from Stamping Bella) and (of course!) masked them and stamped the large skinny oval from a*muse to ground them. I colored them in w/ markers and sponged the edges of the CS. The sentiment is from Stampin' Up! 's Happy Everything set. To finish off the card I added a few Prima flowers and pierced holes in the Pretty in Pink CS and that was it! STAMPS: Flowahbella by Stamping Bella. CS: Whisper White, Green Galore, Almost Amethyst, Lovely Lilac, Watercolor Paper, Patterned Paper by Pixel Decor. INK: Black StazOn. ACCESSORIES: Watercolor Wonder Crayons, AquaPainter, Ribbon, Fiskars Small Scallop Scissors, CuttleBug Bloom Dots A2 Embossing Folder, Sanding Block, Bazzil White Brads. This week's Ways To Use It Challenge on SCS was to use GLORIOUS GREEN in a card - and here I was thinking "Oh that's easy!!" b/c for some reason I was thinking Green Galore - which is a color I really like!! AURGH!! So this card definitely doesn't fit the challenge. Oh well!! The main image is another one of my new Bella stamps - flowahbella. I just *heart* all these bellas!! You can get them from stampingbella.com - the owner - Emily - is FABULOUS to deal with! So I stamped the flowahbella onto watercolor paper using Black StazOn then watercolored her in w/ my Watercolor Wonder (SU!) Crayons and an AquaPainter. I then adhered that onto Almost Amethyst CS - cut around it w/ small Fiskars Scalloped Scissors, then adhered it again to Lovely Lilac CS. For the BG I ran a piece of patterned Pixel Decor Paper through my CuttleBug using the Bloom Dots A2 embossing folder. I then rubbed a sanding block over it to expose the white (which was actually last week's Ways To Use It Challenge - sanding blocks - so at least I got something right LOL!). 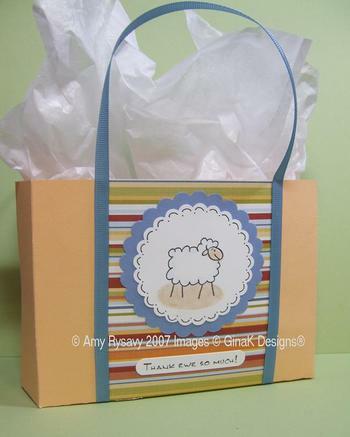 STAMPS: Sheep and Sentiment by GinaK Designs. CS: Whisper White, Brocade Blue, Apricot Appeal, Patterned Paper by Chatterbox. INK: Palette Hybrid Noir Ink, Basic Black Marker. 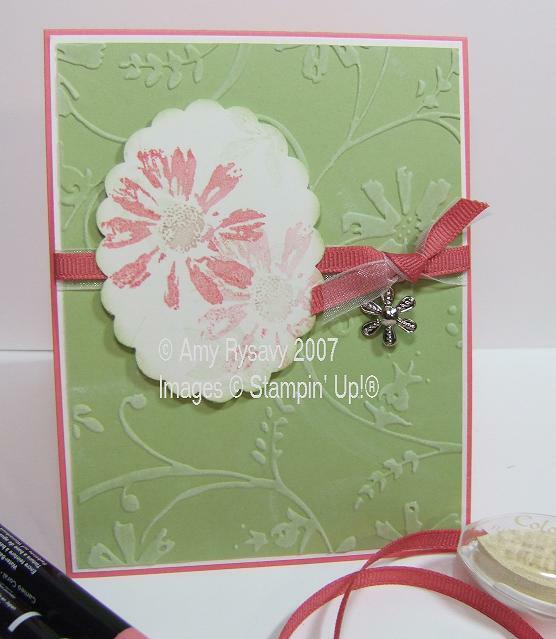 ACCESSORIES: Grosgrain Ribbon, Marvy Mega and Giga Scalloped Circle Punches, SU! Word Window Punch, SU! Small oval Punch, Stampin' Pastels. The challenge was to make a "shopping tote" like the one that was featured in the March 06 Papercrafts magazine. They are really easy to make - I have a tutorial in the works either for here or SCS (if they want it) if there's any interest in seeing one that is!! I stamped the sheep from GinaK onto the Mega scalloped circle punch-out, then masked him, and created another reverse mask w/ the SU! small oval punch (I punched the oval out of a sticky note and used the note itself as the mask) - that's how I got the "ground" covered so neatly. The sheep was also lightly colored w/ pastels (just using the applicators that come in the set), and I drew the little doodles around the circle w/ my Basic Black SU marker. The sentiment was stamped, then trimmed and I used my Word Window Punch to round the ends. STAMPS: Mousey Friends, J'adore and Mini Heart Cluster by GinaK Designs, Paisley BG by Cornish Heritage Farms - all available from stampingfreak.com. CS: Shimmer White, Creamy Caramel, Regal Rose, Going Gray, White. INK: Palette Hybrid Noir, Regal Rose, Going Gray, Creamy Caramel. ACCESSORIES: Lightweight Chipboard Coaster, Iridescent Ice Embossing Powder, 1/8" hand-held Hole Punch, Ribbon, CuttleBug Baby Face Alphabet die, CuttleBug Heart Blocks A2 embossing folder, Prismacolor Watercolor Pencils, Real Red Eyelets, Sponge Daubers, Blender Pen, Marvy Giga Scalloped Oval Punch. So - for the button I used my CuttleBug Baby Face Alphabet die and a lightweight chipboard coaster (got the coaster from StarLitStudio). After I ran it through my CB I covered each piece w/ a different color of ink and embossed them w/ Iridescent Ice embossing powder. I then punched 2 holes in the heart and tied on a little sheer ribbon (got that at Michaels). For the main image - I stamped the Mousey Friends and the Mini Heart Cluster onto a Giga Scalloped Oval punch-out of Shimmer White CS. I then lightly colored it all in w/ Prismacolor WATERCOLOR pencils and used a Blender Pen to watercolor them. STAMPS: Leprechaun Hat and Feelin' Lucky? sentiment by GinaK Designs. CS: Whisper White, Certainly Celery, Going Gray, Old Olive. INK: Palette Hybrid Noir, Certainly Celery, Going Gray, Old Olive, VersaMark. ACCESSORIES: Ice Stickles (Lime Ice), Spring Green PearlEx, Marvy Giga Scalloped Oval Punch, Dimensionals, Sponge Daubers, Ribbon, Hairspray, Ticket Corner Punch, CuttleBug D'vine Swirl A2 embossing folder. The challenge was to use glitter and PearlEx powder on the same card. So I used Ice Stickles (from StarLitStudio) on the hats, and for the BG I embossed it using my CB D'vine Swirl A2 embossing folder, the rubbed VersaMark on the embossed swirls and then covered it w/ Spring Green PearlEx powder. I then used hairspray to set it as the PE will rub off really easily when the VersaMark starts to dry. 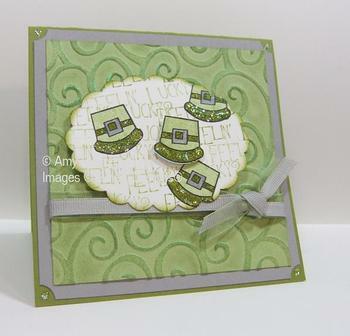 For the main image I stamped then masked the hats, then repeatedly stamped the Feelin' Lucky? sentiment. This is a 4.25 x 4.25" square card. 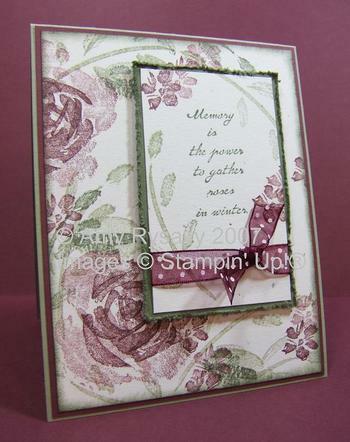 STAMPS: Roses in Winter. CS: Confetti White, Always Artichoke, Mellow Moss, Bravo Burgundy. INK: Always Artichoke, Mellow Moss, Bravo Burgundy. ACCESSORIES: Dimensionals, Cutter Kit, May Arts Ribbon. The challenge was to use one of your favorite songs as the inspiration for your card. It took me a while - but I finally settled on 'Every Rose Has it's Thorn' by Poison (not totally original and pretty easy but oh well! LOL). 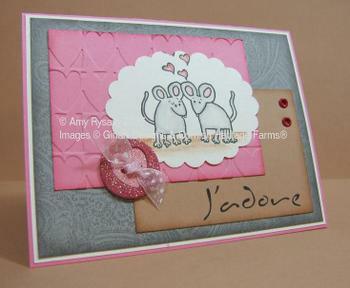 I *heart* that song - and this card was really easy to do -definitely under 15 minutes! The sentiment was stamped then I added some ribbon I got from StarLitStudio, and matted it onto CS that I distressed using the SU! cutter kit. STAMPS: Weather or Not (retired), a*muse lowercase polka-dot clear alphabet, Karen Foster snap stamps. CS: Very Vanilla, Creamy Caramel, Bashful Blue. INK: ColorBox Fluid Chalk Cat's Eye ink pads in Alabaster, Creamy Brown, and Ice Blue. ACCESSORIES: Yarn, Cutter Kit, CuttleBug Snowflakes A2 Embossing Folder. For this one the challenge was to use yarn or fibers on the card and bonus points if you used a mitten image. So I used the retired Weather or Not set, some yarn from the stash I have from the throw I'm crocheting for our living room (a work in progress that's for sure), and of course my new CuttleBug Snowflakes A2 embossing folder. I used Colorbox Cat's Eye Fluid Chalk inks for the whole card - they look really nice in real life but it was really hard to get a decent picture of it!! I rubbed them onto the embossed snowflakes, and used them to get the multi-colored mittens - they are so small and easy to get different colors on one image w/ b/c of their shape. I made the sentiment using the a*muse lowercase Polka-dot Alphabet for the 'cold' and my Karen Foster Snap Stamps (the smallest casual font set) for the rest. You can see the first couple of cards I did for the VSN challenges here. I finally HAD to clean up all this b/c I had no room left to shove things aside to be able to take pics, everything was falling on the floor, my stack of paper scraps was starting to teeter, I had no less than a half-dozen large punches sitting out, and I was starting to have REAL trouble finding any of my scissors (I have 4 pairs!). But like I said tho - I had fun - so it was worth it!! It was SO enjoyable to sit and stamp for the heck of it - lately I've been making things b/c I HAVE to (Design Team work, workshop preps and displays, things for orders etc etc etc) and after a while that can be draining (at least for me it is). STAMPS: Petal Prints. CS: Whisper White, Certainly Celery, Cameo Coral. INK: Certainly Celery, Cameo Coral, Creamy Caramel, Colorbox Cat's Eye Fluid Chalk ink pad in Alabaster. ACCESSORIES: Marvy Giga Scalloped Oval Punch, Sponge Daubers, Dimensionals, Ribbon, Charm (Decorative Details from nunndesign.com), jump ring (from Michaels), CuttleBug Stylized Flowers A2 Embossing Folder. This was a really quick and easy card. I embossed the BG w/ this CuttleBug folder, then rubbed the Cat's Eye ink pad on it to make the embossing stand out a little more. I attached the charm to the ribbon using a jump ring (from a pack I got at Michaels in the jewelery section a long time ago). STAMPS: Oh So Sweet (retired). CS: Whisper White, Certainly Celery, Close to Cocoa, Real Red. INK: Certainly Celery, Real Red, Chocolate Chip, White StazOn. ACCESSORIES: Sponge Daubers, Dimensionals, Ribbon (Michaels), Window Sheet, Bazzil Brads (color - Hershey). I used markers to get the different colors on the strawberries, cut them out then adhered 2 of them to the Celery CS w/ glue and the third w/ a dimensional. Yup, you guessed it - I got some more Bella stamps!! WooHoo!! I got nursabella, flowahbella, javabellas, stampingbella (of course! ), and parisbella. I am having THE hardest time limiting myself - I want them all!! I've been in a bit of a stamping funk for the past couple of days - I just haven't really "felt" it if you know what I mean. But after my envelope of Bellas arrived I thought it was high time to get back in the groove! And what better way to do that than to participate in this week's SCS Color Challenge. STAMPS: Nursabella by Stamping Bella, a*muse small oval, Baby sentiment by Kolette Hall (Michaels $1 stamp). CS: Whisper White, Not Quite Navy, Taken w/ Teal, Night of Navy. INK: Basic Black, Taken w/ Teal. ACCESSORIES: Prismacolors and Gamsol, SU Small Oval Punch, Navy Grosgrain Ribbon, Dimensionals, CuttleBug A2 Baby Embossing Folder, Not Quite Navy Brads, Dimensionals. I stamped the bella first, then masked her and stamped the sentiment and the a*muse small oval (I don't even bother putting that stamp away anymore - it just sits on my desk right in front of me). I used Prismacolors and Gamsol to color everything in, then doodled a border around it all w/ my SU! Basic Black marker. I created the "tab" using my SU! small oval punch, the tied some Navy Organdy ribbon into a knot and adhering it w/ a mini glue dot. 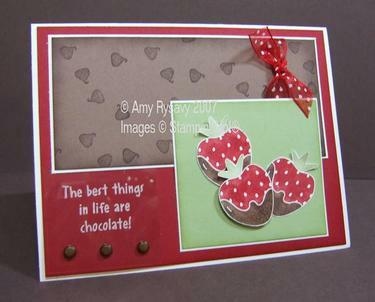 The embossed BG was created using my CuttleBug A2 Baby embossing folder. I think I got my groove back ROFL!!! STAMPS: Happy Harmony, Print Pattern. CS: Whisper White, Brocade Blue, Night of Navy, Bravo Burgundy. INK: Brocade Blue, Night of Navy, Bravo Burgundy, Always Artichoke. ACCESSORIES: Marvy Giga Scalloped Square Punch, Sponge Daubers, Paper Piercer, Small Square Punches, Dimensionals, CuttleBug 2x2 die - Sliders, CuttleBug A2 Embossing Folder - Textile Texture, Ribbon. I made this card for this week's SCS Color (that the oh-so-wonderful Bethie thought up - b/c she ROCKS!!!! *wink*) and Ways to Use It (BG's) Challenges. I used markers on the flowers, then repeatedly stamped them on the punched out scalloped square. I made the photo corners using SU! 's 2 smallest square punches. For the slider - I ran a piece of Whisper White CS that I had glued to a piece of lightweight chipboard through my CuttleBug using one of the Sliders (2x2) dies. I then stamped it and attached it to the card using SU! White Grosgrain and May Arts Organdy (from StarLitStudio). I used my CuttleBug A2 Textile Texture embossing folder on the Brocade Blue CS and sponged the edges. On another note - I have been getting a LOT of questions and requests on exactly *how* I take pictures of my cards. 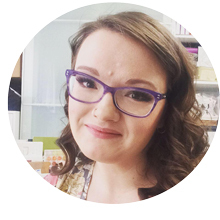 I don't have enough time to be answering each person individually (I tried that and I can't get replies out fast enough) so I'll post on here one of these days (with pictures) what I do and how I do it - don't expect anything fabulous - I have a very simple set up!!! I'll try to get that done and up on here w/ in a week or so. ALSO - I just wanted to make a note to all those that have sent me e-mails, PMs, and comments on here. I've received a few (half a dozen or so) messages from ppl that are quite upset w/ me for not replying to them in a "timely" manner (as in I'm not replying w/in 24 hours). I have to honestly say that there is almost NO way that I can get replies out this fast. I TRY and sometimes I do - but not to everyone. If you don't get a reply from me w/ in a WEEK - then *please* just send me another e-mail to remind me b/c there's a really good chance I missed it!! ALSO - if you have a question that you want answered - send me an e-mail (vs a PM on SCS or a comment on here). I'm more likely to respond to an e-mail as it's a lot more difficult (for me) to keep track of all the comments on here and all my messages on SCS. I DO read every comment left on here (and enjoy them!! So don't stop! *wink*) but I just don't have the time to personally answer every single one - at times I try to answer them in a post on here for everyone to read (especially when it's something that several ppl want to know or it's something I didn't explain clearly enough). That said - I LOVE receiving feedback - whichever the form it takes (comments on here, PMs, e-mails whatever!!) and getting questions from ppl. It just hurts when I get blasted for being "insensitive" b/c it takes me a while to get a reply out. STAMPS: cakeabella by Stamping Bella, small oval by a*muse. CS: Whisper White, Pink Passion, Lavender Lace, Gable Green. INK: Basic Black, Gable Green, Bashful Blue. ACCESSORIES: CuttleBug Happy Birthday A2 Embossing Folder, Marvy Giga Scalloped Square Punch, Sheer ribbon, Prismacolors and Gamsol, Crystal Effects, Dazzling Diamonds Glitter, Dimensionals, Stipple Brush, Ticket Corner Punch. It's *really* late here but I wanted to get this uploaded before I go to bed! One of this week's SCS Technique Challenges (I say ONE b/c this week there's actually 5 different technique challenges - FUN!!) was to do a card that is color blocked. As soon as I saw that I got this idea in my head - and this was it!! I ran 2 different colors of CS through my CuttleBug using the Happy Birthday A2 folder (that I *just* got in the mail yesterday from AllThatScraps - WooHoo!) - Pink Passion and Gable Green (I decided to do the Color Challenge from a couple of weeks ago that I missed while I was at it! ), then cut them up and matted them w/ Whisper White CS. To make it a hat trick I thought I'd do an old Sketch Challenge from a few weeks ago while I was at it! I stamped this cakeabella image (from Stamping Bella) onto Whisper White CS, masked her then stamped the a*muse small oval to "ground" the image, and then *lightly* stippled on a little Bashful Blue ink. I then colored in the image w/ Prismacolors and Gamsol, and added some "bling" w/ a little Crystal Effects and Dazzling Diamonds glitter (really hard to see in the pic but it's there!!). I added some ribbon I got from Jacksonbelle Embellishments, and adhered the main image w/ dimensionals and that's it!! Aren't the bella stamps so fun?? The one thing I really love is the hair - especially on this stamp - I kinda wish I had hair like that ROFL!! !